Earn a B or higher in 6th grade science on first semester (Jan. 2018) report card. Complete 3 seminar credits by the end of the fourth grading period (Feb. 2018). 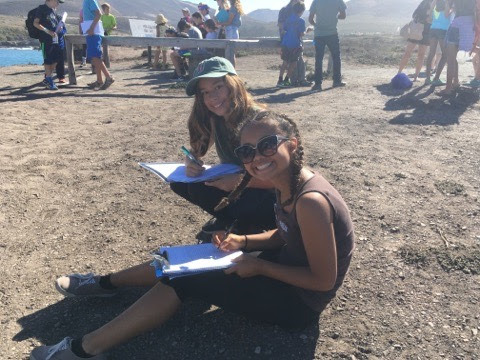 The Science Magnet offers family campouts to Morro Bay (7th grade students) and Joshua Tree (8th grade students). You'll be able to meet other Magnet families, while your 7th grade student can earn up to two seminar credits. Students camp with their families and with other JAMS families while teachers provide instruction and group meeting places. You are responsible for providing your own tent/food/lodging, and for transporting/supervising your children. NOTE: This is a family camping trip- parents are responsible for their children at all times. This weekend is for students that want to participate in teacher led events. If your family does not want to join in on the magnet activities, please make camping arrangements for another weekend!! To sign up: google doc sign ups click here- Google Doc- Sign up for emails and info!! On the sign up you can let us know if you are attending and where you will be staying- whether it's the Morro Bay State Campground individual site, the group site, or a local hotel. Families can also drive up for activities on Saturday, and should also sign up for this option on the sign up genius link above. The group sites only hold 60 people total, so most families will need to reserve an individual site on their own. For individual sites, follow the directions below. Type in Morro Bay SP as the campground. Put in the reservation dates for the night of September 21, 2018 for two nights. Click on RESERVE and pick a campsite. DO NOT pick a handicap access campsite unless you have a valid placard. The upper section has more tent only sites. The lower section has many sites that hold tents or RVs. Invite other families to stay at your campsite with you! Each site holds 8 people so smaller families may want to share. Sign up on the google doc to add your student to the excused list and your email to the database for announcements. IF THE MORRO BAY STATE PARK CAMPGROUND IS FULL - YOU CAN RESERVE A SITE AT THE MORRO STRAND CAMPGROUND which is nearby. To request spaces in the group campsite: THE GOOGLE DOC REQUEST WILL OPEN ON TUESDAY, MARCH 20TH AT 10AM. YOU WILL BE NOTIFIED TUESDAY EVENING IF YOU HAVE A SPACE. An email will be sent out ON MARCH 19th with a link to the application form. Please mark this on your calendars. No further reminder will be sent out. Spaces for the group camping sites are limited and will be awarded on a first come/first serve basis using the time-stamp on the form. You will be contacted by Mrs. Levin to let you know if spots in the campsite have been reserved for you and your family. You will not need to fill out any further forms for sign ups. Each individual site holds 8 people, so smaller families may want to share. Individual sites are $78 total for the two nights. Alternatively, you can book a local motel and join us for the seminars. Download this handout for itinerary and direction. The activities and their order may change.